Pick from the season’s bounty of berries to make a delicious pie that is sure to delight. The pie song in the angel-on-earth movie “Michael” put to music what most people feel: Pie is heavenly. Their flaky, buttery crusts melt on their tongue. Their perfectly sweet fillings bring taste buds to life. And they’re so, so pretty. While Christmas and Thanksgiving have deep connections to pies such as pumpkin and sweet potato, the pies of summer seem to delight us most — baked and served in the warmest, brightest days of the year, devoured outdoors on picnic blankets laid upon barefoot-worthy grass. True summer pies set themselves apart with the vibrancy of their filling and their sweetness — most often the result of the fruits and berries so plentiful in summertime. Peaches, strawberries, blueberries, blackberries, huckleberries and more are ripe and ready for the picking, waiting to become the heart of sweetness and tang within a pie. Fruits and berries seem to top the “it” list for summer pie fillings, as well as classically loved apples that seem to know no season and tropical fruits that bring to mind far-flung destinations with sun and sand. Pineapple tarts, banana crème pie, coconut cream pie, key lime and lemon meringue … the list goes on and the flavor profiles are as diverse as the colors of the rainbow. They can be tart and creamy or sweet and silky, refreshingly cool or piping hot. And even if you’re not a fruit loop, custard and pudding fillings such as chocolate silk and vanilla will keep your fork piled with pie and your sunny summer days satisfyingly sweet. Whatever the pie, there is one important thing foundational to achieving perfection: the crust. Flaky, buttery crusts are key to a great pie, and while you can certainly make a good pie using a premade shell, there’s nothing quite like a crust made from scratch. “When you’re making a crust using butter, the important thing is to keep all of the ingredients cold to prevent the butter from melting or being absorbed by the flour before it goes into the oven,” says Mark Cross, certified master baker and co-owner of Tasty Pastry Bakery on Market Street. “Cut cold butter into small pieces and add it to the flour before adding the water, then mix the dough just enough to incorporate the liquid. It’s important not to overwork it, or it will become too tough. Chilling the dough again will let the butter set up and the gluten relax, which creates a flakier crust and prevents it from becoming too tough once it’s rolled out into a pie shell,” Cross advises. To blind bake, place a sheet of parchment paper over the raw pie shell and weigh it down with pie weights or dry beans. Once the edges of the crust bake golden, remove the weights or beans and allow the empty pie shell to bake a little longer. Only then should you fill it with the fruits, berries, custards or chilled puddings you’ve chosen. Fruits, most especially those without a great deal of natural pectin, by their very nature contain a great deal of moisture, which releases during the cooking process and can cause the crust to become overly wet. “Tossing raw fruits in a mixture of tapioca flour or corn starch and sugar before filling the pie with them will help keep the juices from becoming runny when you bake the pie,” advises Treva Pasquarelli, head baker and owner of Treva’s Pastries & Fine Foods on Capital Circle NE. 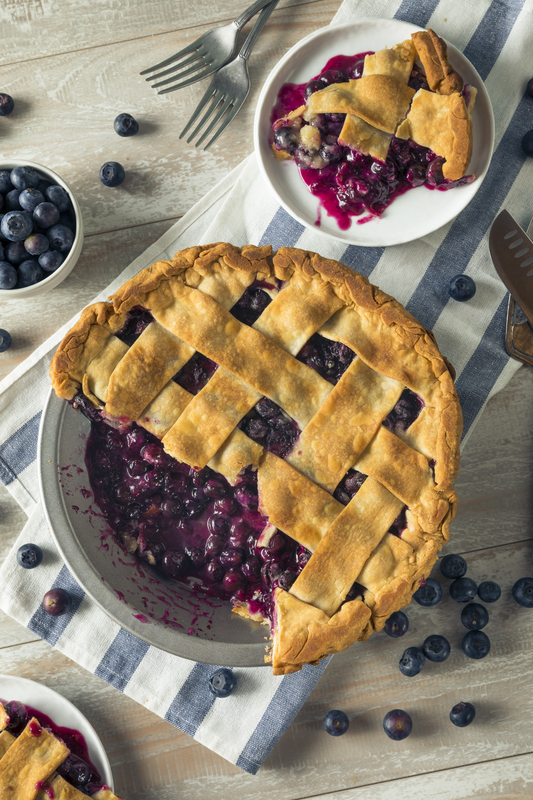 From warm, sweet fruits to cool, creamy custards, fill your summer pies with your family’s favorites, give the kids a spin with the rolling pin, and bake something that will stay in memory long after the dish is empty. Preheat oven to 425 degrees. Meanwhile, line a 9-inch pie dish with one disk of refrigerated crust dough and set aside. In a small bowl, stir together the flour, sugar and cinnamon. Combine blueberries, lemon zest and lemon juice in a bowl, then add the dry mixture of flour, sugar and cinnamon and stir together to fully coat the berries. 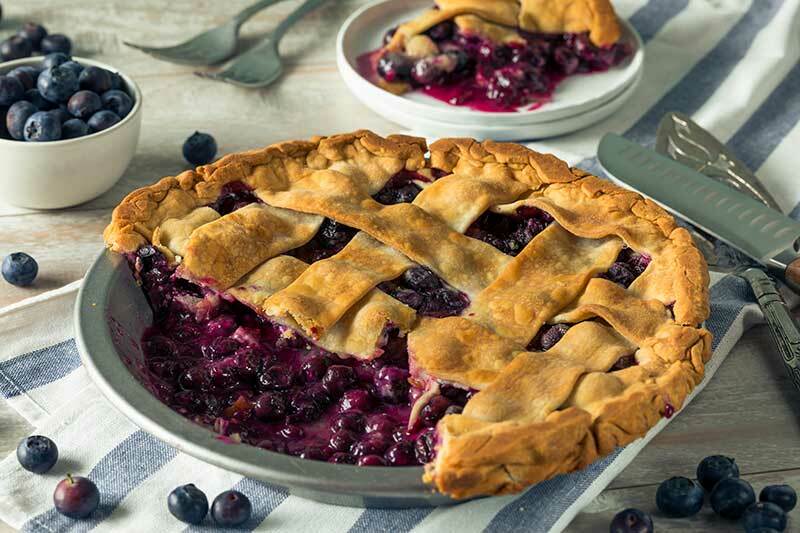 Using a large spoon, place the coated blueberries into the unbaked pie shell. Roll out the second disk of chilled pie dough. Cut into one-half- to three-quarter-inch-wide strips and place the strips over the blueberries, weaving them to create a lattice top. Fold the dough at the edges over the side and crimp together by pinching between thumb and index finger. Brush the top of the pie with water or egg wash and sprinkle lightly with sugar. Bake at 425 degrees for 20 minutes, then reduce temperature to 350 degrees and bake an additional 30 to 40 minutes until crust is browned and filling is bubbling. Transfer to a wire rack to cool.